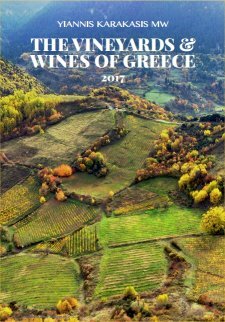 Here I review The Vineyards and Wines of Greece 2017: Decoding the land of Dionysis, by Yiannis Karakasis MW. Note the year in the title – the author’s intention is to update the book regularly. Its 128 pages are available only as a PDF, and can be ordered here for €14. The presentation is attractive, but I might have preferred a simpler format that is easier to print and read on-screen, even if the result were not as aesthetically pleasing. However, I am sure others would beg to differ. The purchaser’s name appears on each page to discourage sharing and you are prevented from copying text from the file, but otherwise there are no physical restrictions on the copying and you are trusted to respect the author’s copyright. This is no massive reference tome, but a great introduction to Greek wine that also gives a good update on current trends. It clearly focusses on the what is important, allowing the newcomer to Greek wine to focus on its most rewarding aspects. There is often a temptation to be too inclusive and comprehensive, even in short introductory wine books, but in my opinion that can easily confuse. Neither is Yiannis afraid to stick his neck out with his opinions. I would say that too is good in books of this type. If you already know something about Greek wine you may agree or disagree with the opinions, but at least there is a starting point for exploration and discussion. Often finding the starting point proves to be the main stumbling block in getting to grips with an unfamiliar wine region. The two forewords in the book include a note from José Vouillamoz on Greek grape varieties. This is followed by Part 1, which has sections on history, current trends and challenges. Also, in a section strangely entitled Down to the basics, there are trends and opinions on the key grape varieties. Part 2 has a map of the Greek wine PDOs, followed by four sections, on Santorini, Naoussa, other islands, and the mainland, where “other islands” means islands other than Santorini, and “mainland” means everything apart from Naoussa. Part 3 is on the Greek grape varieties. It starts by classifying nine of them as Quality, Promising or Pleasant surprises. The same nine varieties are then illustrated and described using bullet points. I felt this used a lot of space and communicated little – I would have much preferred a short paragraph on each variety. Finally in Part 3, the vintages are rated by region, and the aging potential of the nine grapes is commented on, the latter being particularly useful for new buyers of Greek wines I thought. Part 4 has two sections: on sweet wines and Retsina. Yes, Retsina is making a comeback, though judging by comments I have received when praising new high quality Retsinas, they will be a hard sell abroad. Finally there is Part 5, with its classifications and scores. The top producers are divided into the classes of exceptional, excellent, very good and rising. Then there are the top 10s for Assyrtiko wines, indigenous whites, international whites, indigenous reds, international reds, and sweet wines; followed by awards for producer of the year, emerging producer, and red and white wines of the year; and ten profiles of new generation winemakers. Do these profiles really belong in this part on classifications and scores, I wonder? Then, after five pages of pictures of 40 or so producers who don’t get their own profiles, we arrive at something that seems to serve as an introduction to Part 5. The book ends with some 60 pages devoted to tasting notes and scores of some of the better Greek wines, both recently released and older vintages. So, as you can see, I have a few quibbles about the structure of the book, but the main thrust of its content is in my opinion spot on. For me personally, what I gained most was confirmation of a few things I had suspected but not seen expressed explicitly before, and ideas for future exploration of Greek wine. As a small footnote, I had some problems printing the PDF using the latest Windows version of Adobe Acrobat Reader. Yiannis assures me that most people do not have this problem, but if you do come across it, you might like to try one of these two solutions, both of which worked for me. Before printing in Acrobat, try clicking on Advanced, and check Print as image before printing. Unfortunately this results in extremely slow printing, and seems to give poor print quality. A better solution in my opinion is to download another PDF reader called Foxit, and use that to do the printing. This entry was posted in General and tagged book, greece. Bookmark the permalink.